This puppet may not be a real boy… but he just might be a real hero! When bloodthirsty monsters invade Pinocchio's hometown and kill his father, Geppetto, Pinocchio discovers a new benefit to his magical nose: telling lies produces a never-ending supply of wooden stakes to combat the vampire hordes! Will Pinocchio be able to defeat these horrors, avenge his father, and save his friends? 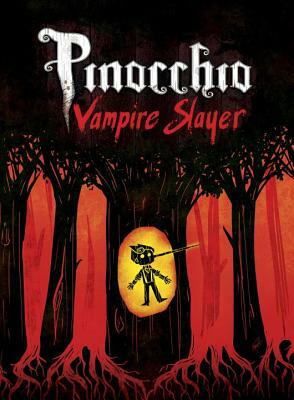 Van Jensen is the writer of the Pinocchio, Vampire Slayer series, which has been named to the Ten Great Graphic Novels for Teens list by YALSA. He's also written several other comics (including The Leg, Cryptocracy, and DC superhero titles such as Green Lantern Corps and The Flash) and lots of articles for various magazines and newspapers. He grew up outside a village in western Nebraska but now lives in Atlanta, GA, with his wife and their dog. In May 2016, he was named a "comic book ambassador" from the USA to the Republic of Georgia.